The internet, or at least as far as I’ve seen, has three favorite peanut butter cookies. 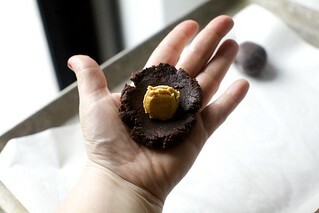 The first is a thing where you take a peanut butter cookie dough or prepared chocolate chip cookie dough, press it into a mini-muffin tin, press a miniature peanut butter cup inside of it and bake them together. Nobody has ever made these for me and I’m kind of mad about it. 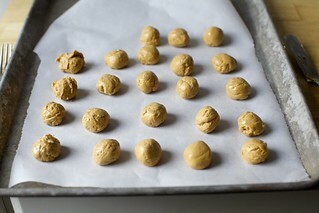 The second is this 4-ingredient, one bowl, hand-whisked salted peanut butter cookie, curiously absent in flour, butter and leaveners, that’s been around forever until the clever cooks at Ovenly figured out that using brown sugar instead of white, them into larger half-domes, and covering them with sea salt raised them to the unforgettable. The third is a soft chocolate cookie wrapped around a peanut butter filling and bakes into peanut butter cup cookies. No wait, pillows. I’ve seen them around for years. I thought I’d try my hand at them one day. But then in December, rumor has it that this cookie won the annual cookie contest at my publisher’s. And as a certain cookie — the gooey oat / bake sale winning-est bars in my second cookbook — won the previous year, this cookie effectively knocked it off its pedestal, oh, my interest was piqued. And by piqued, I mean, how dare it. There was just one little thing. They were kind of pale. I feel with chocolate baked goods, one should go dark or go home. I don’t mean bittersweet; I mean intensity. I mean, I don’t believe a vanilla cake with two tablespoons of cocoa powder in it is a chocolate cake and never will. So, I increased the proportion of cocoa powder, and the cookies came out darker and more chocolaty, but not a whole lot. I considered going to a full half-half split between cocoa and flour, but suspected I’d run into structural issues if I pushed things that far, and instead used Dutch-process (a darker, more nutty variety that’s standard in Europe but sold here too) cocoa and you know how Mary Berry likes to say “why, you’ve really cracked it!” Well, she did not. But when I bit into the first cookie, well, it crossed my mind. They’re soft and brownie-like and basically just deathly good. I had three. Please come and remove the rest from my home. My changes to the standard recipe were as follows: First, I found it a little easier to assemble the cookies if I made the filling first, dolloped it out on a tray, and froze it while assembling the outer cookie layer. It doesn’t take any more time, and those more firm centers are easier to wrap the outer cookie around. I also added some sea salt to the filling. I found that the suggested amount of filling (3/4 cup each of peanut butter and sugar) consistently made way too much; I’ve reduced it slightly here (2/3 cup each) but you will likely still have a few blobs of extra filling; seems safer than too little. I found that a little more than the usual teaspoon suggested is ideal for the filling; I use a teaspoon measure and mound it a bit on top, so it’s more like 1 1/2 teaspoons. This gives you an almost equal striation of cookie-filling-cookie. My bigger changes were to the chocolate cookie itself; I increased the amount of cocoa and decreased the amount of flour for a dark, more intensely chocolate cookie. 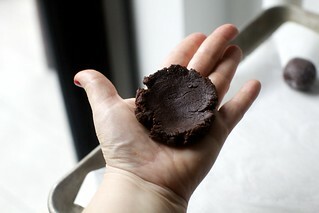 I then used Dutch/Dutched cocoa instead (a nuttier, darker cocoa standard in Europe but sold here too under brands like Droste and Valrhona; I then used baking powder (which needs to be used in larger quantities) instead of baking soda because Dutched-style powder doesn’t react as well with baking soda as well. If you don’t have Dutched cocoa and want to use natural (i.e. any American brand such as Hershey’s or one labeled as natural), you can do so here and use the more standard 1/2 teaspoon baking soda instead of 2 teaspoons of baking powder; it simply makes a lighter-colored cookie. 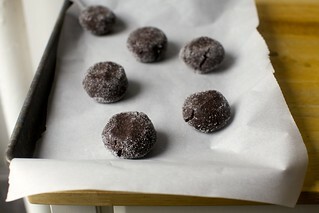 Heat oven: To 375 degrees F.
Make filling: Line a small tray or plate with parchment paper. 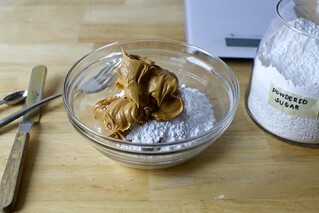 In a medium bowl, mix peanut butter, powdered sugar, and salt with a fork; it’s a little messy but it will come together. Once evenly mixed, use a teaspoon measure to scoop heaped teaspoons of filling into little balls. Spread them out on prepared tray or plate. Once you’ve used all the filling, put the tray in the freezer while you make the cookie portion. Make cookie with a hand or stand mixer: Beat softened butter with peanut butter and sugars until creamed together. Add vanilla, egg, and salt, and beat until combined. Sift in baking powder and cocoa, beat to combine, then add flour and mix until flour disappears. Make cookie in a food processor: Pulse flour, cocoa, baking powder, salt, and sugars in food processor until mixed. Cut cold butter (if using, softened works fine here too) into chunks and add to bowl. Run machine until fully blended. Add peanut butter, egg, and vanilla and run machine until it is blended, scraping sides down as needed, and then keep running until dough balls together. Assemble cookies: Place 1 to 2 tablespoons extra granulated sugar in a small bowl. Line a large baking sheet with parchment paper. Take a scoop of cookie dough that’s just shy of 2 tablespoons (a #40 scoop holds 1.75 tablespoons and is perfect for this) and place it in the palm of your hand. Flatten it with your fingers. Take a peanut butter filling from the freezer and place it in the center, and wrap the chocolate dough around, rolling it in your palms until smooth. Roll it in the granulated sugar to coat, place it on your prepared baking sheet and gently flatten the cookie, just slightly, with your fingers. Repeat with remaining dough. Bake cookies: For 8 to 10 minutes. This is going to seem like really little time, and the cookies are definitely going to look underbaked, but remember that we are just baking a thin outer shell of a cookie (the center doesn’t need to be baked), and this does not take long. Let cookies rest and set up on baking sheet for 5 minutes before transferring to cooling rack to cool. Store: At room temperature in an airtight container. Deb, you mad genius! And just in time for super bowl too. Hello, weekend plans. Good thing I already ate all of the Alison Roman cookies. That’s not blasphemy, that sounds delicious! Thank you for sharing this lovely recipe. I’ve made it twice now and each time I’ve had to add a 2nd egg and a bit of milk to bind the dough together otherwise it is too dry and would hold. I’ve measured and followed the recipe exactly each time. Is it possible you made a error in the number of eggs. With the modifications, these are fantastic cookies. Everyone loves them. Thanks for noting this. My experience as well. Next time I will add a second egg. What kind of peanut butter do you use? Could you use a “natural” creamy PB with nothing in it but peanuts, or do you need Jiff/Skippy/etc. for this to work? Thank you! Hi Deb – would creamy all-natural peanut butter work here? Can you make these without chocolate, would you sub more ap flour? I haven’t tested them without chocolate, but my guess would be if you swap the cocoa with flour, or maybe a teaspoon or so less, you’ll be fine. I made these cookies using organic creamy peanut butter (the Whole Foods brand) that contains oil, sugar and sea salt already. So I didn’t add any sugar or salt to my peanut butter. 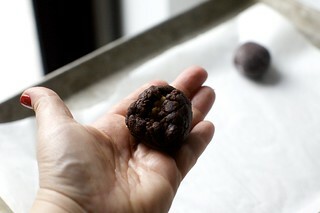 Instead, I chilled it so it was easy to work with and could “scoop” small balls of it quickly (before it warmed up). Froze these and used as is, once the chocolate cookie part was ready. I also sprinkled a some flaky sea salt on top. Fantastic cookies! seems like a whole different cookie without the chocolate — why not just make a peanut butter cookie like the 4-ingredient one she linked above (they are AMAZING)? I like that they are stuffed with peanut butter and I want to put jelly in them too! Hi Deb, these look fantastic and I can’t wait to make them! When you say ‘creamy peanut butter’, do you mean the emulsified kind with added sugar (like Jif or Skippy), or do you mean the kind that’s straight up ground peanuts that separates if you don’t stir it? I usually have the second kind on hand, but would go get the emulsified kind if that’s what’s called for here. Thank you! In general, when baking, those ultra creamy ones are best. But I’m not as worried here as I’d be with other recipes. Probably a natural peanut butter will work, but of course, if it seems grittier or more crumbly or not sweet enough, we will know the culprit. I tried using ‘Adams’ natural peanut butter in the smittenkitchen peanut butter brownies, and it just wouldn’t setup the same as the less natural Jiffy I tried second. If your natural peanut butter is real thick, you might be ok. If you happen to live near a Wegmans, Wegmans makes an organic creamy peanut butter that tastes like Jiff…it has the sugar and oil and such, but at least no cottonseed oil! I’m not sure, but you can definitely try it. I’m not sure, but have a feeling the brown sugar would be too grainy here. Haha, Deb just beat me to it! If you are going to sub, it might be smart to either get the ultrafine white sugar, or run it through the food processor for a bit if using plain white sugar, that should cut down on graininess…. Do you have a way of making the brown sugar much more fine and powdery, like pulsing it for a bit in the food processor? I haven’t made these yet, but I’ve made other recipes that require peanut butter and powder sugar to be blended together (peanut butter pie, mmmmm), and the powdered sugar really helps make the peanut butter moldable in a way that the larger crystals of brown and granulated sugar may not. I’d try whirring the brown sugar (or coconut sugar? hmmm….) in the food processor to make it more powdery…. maybe with a drop of cornstarch. I’m not positive this is necessary since the filling is, well, just filling. But I suppose a teaspoon of cornstarch in there won’t do any harm. Have you tried organic powdered sugar? It has a different starch and it tastes much better, imo. Just whizz regular sugar in the blender for a minute and you will get all natural powdered sugar – I’ve done this with evaporated cane juice as well as coconut sugar if you are anti-white sugar – it works perfectly. I’ve made a similar recipe from Martha Stewart for years, and that filling is peanut butter and brown sugar. It has a little texture to it, but I think it’s delicious. It also calls for less; it uses 1/4 cup brown sugar for 1/2 cup peanut butter. The recipe is Chocolate Peanut Butter Surprise Cookies. The cookie part of this one sounds better though, so I might switch to this one but keep the brown sugar filling that tastes like a Reese’s cup. That Chocolate Peanut Butter Surprise recipe is the one I’ve used for 18 years [though now I sub the shortening in it for more butter]. I can’t stand powdered sugar either, so I’m happy to use the brown sugar. If the problem has to do with the taste or other ingredients in powdered sugar, I grind up my regular sugar in a quick and easy coffee grinder – the ones that have only one speed. It’s easy, tastes great, and does the trick. You could also just put sugar in the food processor and make your own powdered sugar for this application specifically. Thanks Scott! That was my number one question! I apologize in advance because I hate when people ask these types of questions, BUT do you think the cookie part would work in a blender vs. food processor. I am thinking maybe not, and I would be better off doing it all in the stand mixer? My food processor is broken right now :( and I really want to make these this weekend for the Super Bowl! Stand mixer would be better than a blender, for sure. Not the first time I’ve seen one of your recipe titles in my blog feed and said “You’ve got to be f-ing kidding me Deb” out loud to myself, alone in my house. Of course I’m going to make them immediately. Would dulce de leche work as a filling? I have some extra hanging out in the fridge. Perhaps if you thicken it with a thickener such as cornstarch or flour? And do the scooping out and freezing portions as Deb recommends for the PB filling, since that would definitely make it easier to assemble the cookies before baking. In Argentina there is a dulce de leche that is very thick,specifically for making desserts. So it depends on which one you are using? If you are using a beautiful one like Salmandra, probably too gooey. If you get the tin of nestle at the supermarket here, probably- just mix in some vanilla (and maybe a tiny splash of bourbon, because, you know). I would then freeze it for scooping. If you make your own, I have in a crock pot, from scratch, just whole milk and sugar, vanilla added at the end, just cook it longer so it is thicker. (But really the tin is just fine- clearly they just take the sweetened condensed milk and cook it for you so you don’t blow up your kitchen trying to do it yourself). But I loooove this idea, and will try it when I get the chance!! You, SarahB, are a woman after my own heart. I don’t love peanut butter, but I do love dulce de leche and bourbon! Going to try this! Do you think I could assemble the cookies and then freeze them, to bake on Valentine’s Day (ideally straight from the freezer, just adding a few minute to the time)? Unfortunately desserts are covered for our Super Bowl party or I would definitely be making these. They sound unbelievable. Absolutely. I baked some of these from the freezer, too. Just made these with my 4 year old. They are perfect. Used Hershey’s cocoa and the baking soda as directed in the notes. Really good. Only better thing – as Deb said – would be to use the nuttier and darker cocoa. Do you think these will defrost nicely, if frozen after fully baked? I’d think so, but I usually freeze cookies (and froze these too) unbaked and then bake them right from the freezer. How long do you bake them for when placing them in the oven straight from the freezer? I have exactly 2 hours and 34 minutes until I’m done with work for the day. I am going directly home and making these cookies! Seriously Deb, do people stop you on the street and tell you how adorable your kids are?! The cookies look amazing too! This was basically my goal. Why do you do these things to me?! Yummmmmm. Must. Bake. Now. Dear Deb, how would you recommend veganizing these? I need to make them for my partner’s bday! Someone is already on it! These sounds fabulous! I am going to make them for Superbowl Sunday. One question – do you think the King Arthur Black Cocoa powder would work for this recipe? I recently used it for a chocolate cake and it added so much intensity and depth of flavor that I am looking for ways to use it again. The cake recipe called for regular Dutch cocoa plus a tablespoon or two of the black cocoa. Absolutely. It’s so intense that even swapping in a tablespoon or two will do the trick. I am trying it and will let you know. I think in my case I needed to add it because my cocoa is not dutch processed (thought it was – darn!) but it is good quality Ghiradelli cocoa so hopefully the black cocoa will give it more depth and intensity of flavor. I’m tempted to rush into the kitchen and make these, but I just made the salted chocolate chunk shortbread for the second time…and with no issues, I might add. The cookies, the peanut butter chocolate ones, remind me of the cookies I made from Marbled Swirled and Layered by Irvin Lin. They are delicious, yours might be easier. Funny, I have that book on my table right now — late to it, but am eager to go through it. I’m making both of them today, why the heck not. and here I was just wandering in to wonder if one could leave out the sugar in the peanut butter filling (in ever constant pursuit of the dessert for those of us w/o a sweet tooth…) Since it has egg, it already has a binder, right? The egg isn’t in the center, but in the cookie. Can try without the sugar, but I might try reducing it first instead. I haven’t made these yet, but I, too, laughed when I saw the note about storing them. Who has the will power/needs to store cookies???!!! In my house, they get eaten right away! So I came here to decide on a chocolate cookie to make for a work Cookie Competition next week, and I thought I would choose World Peace cookies, but WHEEE these are it! I am totally winning, thank you thank you. Any chance someone has weights for the filling portions and the cookie portions? I don’t have the right scoops! Would 100% natural raw cacao work here? I’m not sure how it is different, but I bet this dough is forgiving. Having toured Theo Chocolates in Seattle, I’d guess that it will be a lot different. Cacao beans are roasted in order to develop their flavor, then they’re ground. Raw would be a totally different flavor profile. These sound utterly amazing. Now, if only I had a freezer that was big enough for sheet pans! I always want to sob when I see that line in a recipe! Small London kitchen = combined fridge/freezer with very shallow drawers so keeping anything flat is impossible and things like this just won’t fit. Still, I’ll attempt it by putting them in the fridge, and hopefully that will work! Use a plate! Or skip it. All gazillion copies of this recipe on the web suggest using it unchilled, scooping it right into the center. I simply found it easier to get the peanut butter centers firm-cold first. But you’ll be fine without this step. The instructions for making the cookies in the food processor or mixer say to beat in the peanut butter to the dough. Is that a typo? It seems like the peanut butter is only supposed to be in the filling? There is peanut butter in both the chocolate dough and the filling. and that’s why we love you. I think I must have used a thinner layer of chocolate wrapping than recommended, because I still have lots of the dough left, but, wow these are unbelievably good! I’m that weird person who doesn’t like peanut butter in sweets. I was thinking of toasted marshmallow filling. What if I burnt campfire marshmallows with a small torch and then froze them… I’ll try it out, for science! These look so good! And love having these on hand for a quick on the go snack,Thanks for sharing!! Made these with creamy natural peanut butter for those wondering, and they turned out great! Texture is really good and flavour is amazing. Only other difference is that I cut down the granulated sugar a bit, because I just prefer things less sweet. I definitely didn’t miss it, but that’s totally a matter of personal taste. Ditto. I was coming to say that it worked fine with natural PB and less sugar, but Helen already said it. I used a scant 3/4 C granulated sugar and then poured in a bit of molasses (didn’t measure). Hershey’s does a Dutched version — sold under its brand as “Special Dark”! We’re stationed overseas and I stock up around Christmas, because it’s the only time our commissary has it. Not as good as Valhrona, of course, but definitely a step up from standard Hershey’s and quite Oreolike! Can’t wait to gove these a whirl once my hubby gets back from deployment…he’ll FLIP. I had balls of Deb’s Browniest Cookies (https://smittenkitchen.com/2015/12/the-browniest-cookies/) in the freezer so I did a shortcut to a variation on this recipe by defrosting those and wrapping them round the peanut butter filling. Should have cooked for a minute or two longer than 10 minutes as some of the chocolate cookie was still gooey and the peanut butter totally gooey. Totally delicious, though. I used natural peanut butter but added a spoonful of coconut oil when the peanut butter mixture seemed too dry — maybe that was the culprit in terms of the gooeyness, but otherwise I don’t think the peanut butter mixture would have come together in balls. Peanut batter cookies are one of my favorite cookies, but I am partial to my peanut butter shadow cookies which I have been making for at least 40 years. Delicious! I made them with all natural peanut butter (peanuts are the only ingredient and it’s non-emulsified) and they turned out great! I made something like this about a year ago — I didn’t realize there was already a recipe that was an internet sensation out there, so I hacked it together myself. 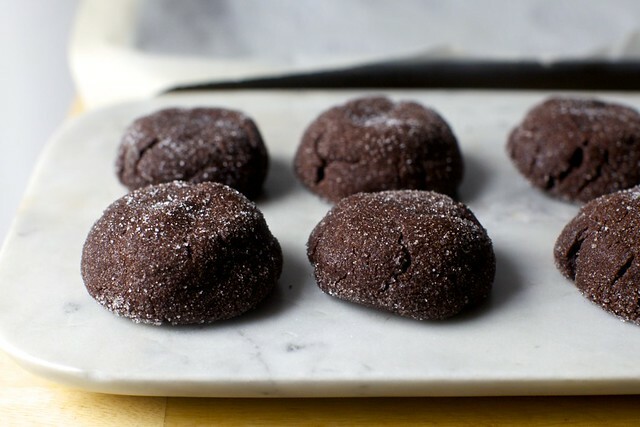 Basically it was PB and powdered sugar as your filling notes, plus the use of the King Arthur Flour Chocolate Crinkles as the exterior — which I have always thought had a pretty intense chocolate flavor and doesn’t include more PB to detract from the chocolate. Got rave reviews. These cookies sound amazing…my grandson will love them. While I’m here….I have to say the strawberry cloud cookies, from your latest book, are really something special. Trader Joe’s has freeze dried strawberries really cheap. I’d never even noticed they sell freeze dried fruit! I got mango too..so we’ll see how mango clouds turn out!! Meringues keep well in dry Denver. Thank you. It was seeing them at TJs that pushed the idea from “nobody will ever be able to make these” to deciding they could go in the book! Glad you’re enjoying them. Have been eager to play with other flavors. Hi Deb, can I use the black cocoa powder that you call for in chocolate peanut butter icebox cake from your new book? Not sure if that’s the same as Dutch processed? Black cocoa powder is ultra-Dutched, and yes, it will work here. However, it’s so impactful, you might find swapping in a tablespoon or two is all you need to give the cookie the full Oreo effect. So, how about the black cocoa? Like the one in the Oreos? I really love the darkness, but it does change the flavor a bit. I think I can still find the Hershey’s special Dark cocoa in some supermarkets, but I did buy it online from a specialty chocolate place. Between your homemade Oreos and DL’s black brownies, it’s now topping my special requests from friends. If I did use it, I think the soda/powder would be like the regular dutched recipe? Any thoughts? If I used Hershey’s Special Dark cocoa, which is a combo of natural and dutched cocoa, what would you suggest using – baking powder or soda? Thanks. Sorry, just saw the comment right before mine asking the same question. I thought I had read them all. Amazing!! So rich and decadent. The perfect chocolate PB cookie. First of all YUM! Ok, question re their shape: do they spread or change shape very much when you bake them? I’m thinking of pressing into a heart shape after rolling in sugar for VDay cookies- what do you think? They puff and spread a little, not a lot. It’s worth trying! Let us know how they go. One replacing peanut butter with Nutella (in the cookie dough adding 3 extra tablespoons of butter and 1 extra egg yolk to compensate for the loss of the fat in the peanut butter) and in the filling scaling back the powdered sugar and adding a teaspoon of salt to balance the sweetness. I made about 10 of each when I realized I could also tuck in a Trader Joe’s peanut butter cup and Ferrero Rochero respectively. Win! Deb, did you try this with crunchy peanut butter instead of creamy and decide against it? I have on hand Santa Cruz crunchy roasted natural peanut butter and would like to use it if possible. Thank you! I didn’t, but I think it would be great in the middle. Not sure how well it would work in the cookie portion. Thanks, that makes sense. I might try tahini in the cookie. OK…these are definitely going in the chocolate/peanut butter rotation. But if I may be so bold as suggest an additional chocolate peanut butter option loaded with intensity? I made these chocolate shortbread peanut butter cookies this Christmas. They are like a unbelievable peanut butter Oreo! Exactly how you like the intense chocolate Deb! I found them on a german cooking website and was intrigued because peanut butter is not a huge ingredient in Germany. It’s in German but Google Translate does a great job. The only thing I did differently was use YOUR method of rolling out the dough evenly, refrigerating and cutting PERFECT round cookies! My daughter and I are gluten sensitive. Can I use gf flour or could you post the flourless version? We are gluten intolerant here, and I was looking for the same thing! Please do share! Thanks! I’m jealous of people who can actually fit a cookie sheet in their freezer. Don’t want to get into much trouble here :) but am I a bad person if I just want the cookie alone without the peanut butter filling? I realize it would change the name of the cookie, but I enjoy the subtle peanut butter flavor mixed in with the chocolate. I made a few empties; it’s a soft cookie with a crispy sugar edge, i.e. quite lovely. And here we were happy with double PC cup cookies with a Reese cup in the center. These seem closer to the brownie cup cookies I have seen. Can’t wait to try them! Just made these, wow! So good. Thank you. Oh you wonderful person, thanks for the help with weights! Weirdly, mine only came out to 15 cookies at 50g. I just made these and they may possible be the best cookies I’ve ever made. Self control is going to be difficult. I just made these to bring for the big game tomorrow, I ate two and they are phenomenal!! Thank you, a supreme indulgence! Hi Deb. My daughter just made these, and they are delicious. Our question is about the dough…ours seemed pretty dry. Yours looks moister and seems to hold together better. Any ideas? I experienced the same thing- very dry cookie dough. I was still able to assemble the cookies but it took quite a bit of work. Next time I’ll watch my measurements even more closely, but any other tips are appreciated! I had the same problem last night. I ended up adding a bit of coconut oil to the mix and had to work the dough quite a bit to be able to shape it without it crumbling. The final product didn’t look as moist and brownie-like as in the pictures here. I did use a natural peanut butter, so I wonder if that was part of my problem. My dough was somewhat dry too (I started with cold butter), but I wonder if it wasn’t worse because I have very limited counter space and was assembling the cookies right next to the oven. I know that proximity to the oven is why my peanut butter balls started melting. Same here – the dough was very, very dry. The cookies still turned out fabulous…. it was just hard to get the dough to stay together! My dough was very dry and didn’t come together like dough. It was more like crumbs. I added a little water and butter to make it workable. I used the gram weights rather than measuring cups Would love thoughts on what went wrong. I had the same issue with the dough being very dry; even made them twice with very careful measurements the second time to the same result. Not sure if the type of cocoa powder used could make a difference; I wanted the very dark chocolate cookie, so went with 50/50 King Arthur Triple Blend and Black. I added an extra 1/4 cup of butter to the second batch, which made the dough perfectly workable and soft when baked. So for what it’s worth I just made these and accidentally melted the butter- it’s cold in my house so I put the bowl with the butter, sugars and pb on top of the woodstove for “a minute” just to soften, forgot about it, came back to melted butter, put the bowl in the fridge for five minutes to at least knock the heat down, proceeded as written and the cookies were perfect and extremely easy to assemble. Moral of the story: softer the butter the easier the dough, in my experience. I planned on bringing a batch of these to a friend tonight – she’s making me supper and I happily offered to bring dessert. But now that they’re done baking…and I’ve sampled one…well, two dozen seems like a lot. Would half be okay? I mean, to be fair, they’re a pretty substantial cookie. Maybe 8 is better. Or 6? On a pretty plate? Darnit – I want to hoard them all…crazy delish! Delicious and great fun to make! Thanks for the recipe! Seems so easy to use the mini unwrapped Reese’s for the filling any reason why that wouldn’t work and have a very similar effect? I made these, but only had “Extra Crunchy” Jif at home… and I think that substitution made the fillings more manageable! They were probably more dry than the smooth version, but didn’t even need freezing before putting the cookies together. Because I made the cookie dough in the food processor, any peanut chunks were effectively pulverized (I did, however, add maybe 1-2 extra tablespoons of PB to the dough, since the fillings had shown that crunchy is not as wet as smooth). The result was delicious, and for once my laziness/refusal to go to the store was sort of rewarded! I only have Hershey’s coco at home. I’m confused by the note…. 1/2 tea of baking soda instead of 2tea of baking powder? Was thinking of maybe making a simple macaroon, adding a bit of egg? I would try mixing shredded coconut with some condensed milk, rolling into balls and freezing like the recipe directs. I like this recipe because it has all ingredients I like (chocolate and peanut butter). Do you think I can make these as hamentaschen (by not fully enclosing the PB filling)?!?! Definitely do not skip the freezing of the centers step and only take out as many as you need for each cookie sheet. They soften up and it is harder to wrap the filling around the centers. I used about 12 g of filling to about 30 g of cookie and found the ratio to work well. The cookies barely spread, so I put them about an inch apart on the second batch. If there is one left that does not fit on the pan, the assembled cookies are also delicious raw (not that you could not have guessed that yourself). I foolishly decided to try to make a double batch in my food processor. It does not fit. I am glad that I stopped by Penzey’s o get some Dutch high fat cocoa. I typically bake with their natural high fat cocoa, which I am sure would have been delicious, but the really dark color is lovely. I a man so excited to bri these to a Super Bowl party tomorrow. What size is your food processor? Glad they were a hit. I made a double batch in my ancient DLC-7 Cuisinart (I am guessing it has a 7 cup capacity). It was likely filled beyond the suggested level, but worked fine- needing just a bit of mooshing in some bits of cocoa and flour after it was dumped into a larger bowl. What if you added a little espresso powder to the dough? That might enhance the chocolate flavor? Can’t wait to make these! I realised the hard way why you don’t use chunky peanut butter with these. Thanks for this recipe and tutorial on ig stories, Deb! Made these last night, is that a bit too keen? Best cookie ever. Cookie doesn’t seem to do these justice. Perfect ratio of PB to soft, slightly crunchy cookie. Amazing when still warm….and just for quality control…perfect when I ate 2 for breakfast this morning. My dough was crumbly and seemed dry. Is this normal. Got up early this morning and made these cookies. A couple of questions – is the cookie dough supposed to be crumbly and are these cookies supposed to be HUGE? By the time I had the dough around the center, they were about the size of a golf ball. Thanks. They are delish!!!! A little crumbly keep patting them smooth, and yes, big. You can make them smaller, and in almost all cases I prefer small cookies, however, because we’re using a teaspoon measure for the center and I’m using a fairly standard cookie scoop for the outside, I didn’t want to make it more complicated with odd measurements. Do you think swapping the peanut butter for Nutella would work? This is one of the best cookie recipes – and cookies – of all time, at least in my world. Easy to make, but looks impressive and complicated, and holy deliciousness, Deb. Even with accidentally forgetting the peanut butter in the cookie batter until the last minute – meaning after all the other ingredients were already mixed together – and then adding it, they were fantastic. You are a cookie goddess. One question – is there a reason that the cocoa, flour and baking powder aren’t mixed together first and then added to the wet ingredients? Ha I had the same thought and just reused the bowl from the centers for my dry ingredients! Just ate my first one. YUM. I like how dark the exterior is and the center is not as huge as I imagined during assembly (when I was feeling a little doubtful about the proportions). FWIW I used 1 cup whole wheat AP and 1/3 white AP flour and the dough was a bit crumbly but worked fine. I feel sorry for the Girl Scout who came to the door selling cookies right when I was pulling these out of the oven, heh. Just made this for the game today and really, now I don’t want to share. I made a few adjustments based on what I had on hand. Using almond butter instead of pb made for less of a “ball”, even after freezing for 15-20 minutes. But it was still workable. Because I used almond butter, which has a more subtle flavor than pb, I subbed in almond extract for the vanilla and added 1/2 tsp orange zest to the cookie dough (I love orange and chocolate together). 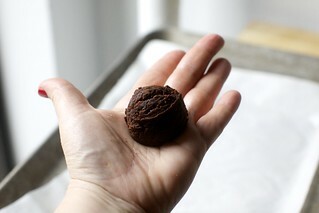 Also, I used cacao powder which made for a lighter brown cookie, but the flavor was still rich and intense. This is an awesome recipe and will definitely be making these again!! Forgot to add that I had no powdered sugar so I blitzed cane sugar in my blender and that worked perfectly. CHOCOLATE PEANUT BUTTER LOVERS SHOULD MAKE THIS A STAPLE RECIPE. I made these last night and rest assured people, you’re going to get a soft cookie rich in peanut butter flavour. The peanut butter in the cookie dough really seemed to bring out the chocolate somehow! I brought them to my in-laws and even got a classic “you MADE these?”. Deb, you’ve done it once again. This is why I continue to follow your blog–you always keep it simple and delicious! Oh my goodness. I just made these for friends coming over for the Super Bowl (going to pipe peanut butter on the top to make them look like footballs for extra festivity) and they are THE BEST. Seriously. The best. Make these now. Next time it’ll be a double batch. made these tonight for the superbowl (shaped like footballs of course, with white chocolate laces) and they were wonderful! I had to make these cookies almost as soon as I saw the recipe. I used Hershey’s cocoa and the 1/2 tsp baking soda as that is what I had on hand. Made 24 REALLY DELICIOUS cookies! Will definitely add this recipe to the cookie jar repertoire! Deb, I wonder if you can help troubleshoot dry/crumbly chocolate dough (we used the hand mixer method). 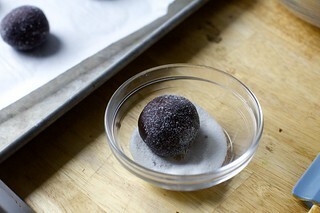 It was pretty difficult to manipulate and smoothly mold around the frozen balls of pb. Any ideas to improve that for next time? Maybe we should have done the food processor. They still taste amazing! Mine was dry and crumbly also when I tried to mix in the flour. Then I used the hand mixer to mix the flour in and that seemed to have solved the problem! I made these yesterday and also found the dough to be too crumbly — almost like sand — and impossible to form around the filling. So I tossed in an extra egg and it worked out fine. Did you begin with cold butter? If so, the important thing (like those Alison Roman shortbread) is to blend it really well. Here, mixing the dough for another minute might also help, and manipulating it in your hand as needed to warm and smooth it. With cookies especially, a little extra flour is usually the reason some are more crumbly. The good news is that even where mine cracked, filling leakage was not an issue. As everyone else agrees, these are delicious. I realized more than halfway through assembling my cookies, when there was less batter than I expected, that I’d forgotten to add peanut butter to the cookie batter. Quickly added a tablespoon-ish to the remaining batter. Happy to report the cookies are soft and tasty both with and without the peanut butter. Next time I’d use closer to 1T than 2T for each cookie since I had a lot of extra center’s and the dough was plenty thick. I need some help with this recipe — I made it yesterday and they look nothing like the pictures. Well, they kinda do, but not really. I mixed everything together and the filling was hard/firm. I even had to add a little bit of water for everything to mix together. When I baked the cookies, the PB filling remained a hard little ball. It did not melt or soften to the shape of the cookie. I used the food processor for the chocolate cookie bit and the dough was super soft. The outer dough is supposed to be soft. The peanut butter filling is supposed to be firm when mixed, but should bake up with a soft center. What kind of powdered sugar did you use? These were great! Recipe was easy to follow. Thanks. Wow, Deb, these cookies are stellar! Delicious, easy to make, and impressive. They were a huge hit at a Super Bowl party, and I’m already looking for another excuse to make them. I was hoping you’d post the recipe before Valentine’s Day when I saw the teaser on Instagram because chocolate + PB is my boyfriend’s favorite, but sadly he broke up with me on Thursday. Seeing the recipe pop up on Friday, along with the joyful reactions from the eaters of these cookies, really brought some needed happiness to my weekend. Oh Liz. I’m sorry about the breakup. So glad the recipe and your friends gave you a lift. You know what they say about the sea and other fish. In the meantime, cookies!! I’d like to mail these to my daughter for her birthday. Does anyone know how long they stay fresh? Don’t want her to get stale cookies! I made these for a superbowl party, and they are AMAHZING. I personally liked them right out of the oven in their gooey madness, but they are just as delicious once cool as well. I will definitely be making these again. I made these yesterday, they are delicious! I could not find 100% Dutched cocoa so instead used Hershey’s special dark which says it’s a blend of natural and dutched coocas. I kept with the 2 tsp baking powder and it seemed to work just fine! I do think that the dough comes out a bit dry, was hard to get all the flour incorporated, I might decrease the flour next time (though I did not weigh my flour, I fluffed before scooping – perhaps I had too much flour?). Also when assembling, I found it easiest to get the cookies all made and then did the sugar roll at the end – that way didn’t keep having to wipe my hands off. Also the peanut butter balls start to thaw out as you are assembling the cookies, so it’s best to work quickly with them. The flavor on these is great, but the construction for me was a bit crumbly. I wonder if anyone has tried them as thumbprint cookies instead? These are awesome. I used a food processor. I weighed the ingredients and followed the instructions to the letter. I made 22 centers and put them in the freezer. I weighed the cookie dough to determine how many grams for 22 cookies – just shy of 30 g per cookie. I weighed a scoop and it was just over 30g so I just didn’t pack my scoop too full. My dough was a little crumbly but came together quickly with the warmth of my hand. I do recommend scooping out all the cookie balls prior to removing the centers from the freezer. Then work quickly. I should have put my centers back in the freezer but I was wanting to get them in the oven and it’s much harder to roll the dough around a soft center. I had a few with cracks and I thought the centers might leak out but that did not happen. Thanks for the weight tips! I weighed the centers — total PB mixture weight was just about 252g and i made 24 PB balls that are approx 10.5g each. freezing overnight and making cookies in the morning — just in time for a dark beer fest at the coast this weekend! I made these to while away a rainy day. I used Dr Oetker dark chocolate powder and Whole Earth crunchy PB and they’ve turned out great! They’re still warm and I’ve had three already….good grief!! Leaving the house for a few hours to make sure there’s some left for husband when he gets home later – ha! Definitely a new fave! I am big into chocolate and peanut butter. Thanks for sharing this recipe on chocolate peanut butter cookies. These are great, and got rave reviews. Used half black cocoa powder and half Dutch process, and they were super dark and rich and perfect. Thanks – I was wondering if black cocoa would work out for these. Made these today using Hershey’s Special Dark cocoa and stevia for the sugar component. Flavor of the baked chocolate cookie and peanut butter center were spot on. The dough was dry enough that I couldn’t contain the middle in the middle-no way to pinch closed. What did I do wrong Deb? Hi Deb- what would be your advice in how to go about making these gluten-free? They look amazing! I just wish I could eat them! Do you have a go-to flour blend you use? Thanks! We made these GF with a 1:1 exchange with Pamela’s Pancake and Baking mix for flour. (Stand mixer version) Delicious! Yes, and I’d use the sweetened one. My son also has a severe peanut allergy. Is sunflower butter the best substitute for peanut butter in this recipe? Or would almond or cashew butter be better? Thanks! Any of the above should work. I like sunflower and cashew as peanut swaps, but it’s just personal preference. What function does the powdered sugar serve in the filling? Peanut butter is already pretty sweet for me. I’m wondering if just peanut butter would work, or peanut butter with flour or corn starch. After making these twice, we have decided as a family that these are the single best cookie on earth. Period. I don’t know what is happening to me in my later years, but I’ve just flip-flopped in my preference for dark over milk chocolate. Let me back up.. The last Hershey miniature in my stash of leftover Christmas candy was a Milk Chocolate. I was having a post menney hot flash and needed a choc hit so…I ate it. What the heck just happened? It melted on my tongue in such a creamy, winsome way and the chocolate flavor was not absent..it was actually quite pronounced and I was questioning everything I had previously thought about milk chocolate. I wondered how long had I been being duped by Lindt and Sharffeburger and others into thinking only the Dark will do? Why not both? So..how come you didn’t just stuff and Reese’s miniature into the middle of this ‘Pillow”, hmmm? Made them this afternoon and shaped half the cookies into hearts. Going to package and send them to my kids for Valentine’s Day. My husband declared them “incredible!” Thanks. These look AMAZING! I love the soft, almost gooey centre. Going to have to try this out sometime. Do you have any recommendations for making this vegan? First of all, these were AMAZING. I love everything chocolate+PB and they exceeded expectations. I used a scale to weigh everything, and because I had it out I realized I could also use it to evenly divide the filling and dough into 24 pieces each. A little nitpicky, sure, but the cookies were perfectly proportioned and I had neither filling nor dough in excess, so that was nice. The mistake I made, though, was bringing them to a party instead of just hogging them all for myself. My cookie dough turned out extremely dry– the texture of damp (not wet) sand. As a result, forming them around the peanut butter balls was a mess, and I had to add a pretty hefty layer of the cookie “sand” to get a thorough covering. This made my cookie-to-filling ratio on the higher side, and I didn’t have enough sand to cover the last 5 peanut butter balls. Headaches aside, the cookies I did have baked up to be very delicious, but I think this recipe needs some work. Just finished these, they came out great. I got 21 cookies. I only have Hershey coca so I added a big pinch of inatant espresso powder. They came out nice and dark and chocolatey. Splurged on the Dutch process cocoa and they turned out perfectly. Rich, decadent combination of chocolate and PB! Thank you for this amazing addition to my rotation! Rather than bake all of them at once, and being known for supplying family members with fresh-baked cookies, I froze not only the pb centers, but about half of the chocolate part divided into individual discs. Thawed only the chocolate before assembling and baking. I made these with leaf lard due to a family member who is allergic to dairy and they came out fantastic. For those not familiar with leaf lard, it does not have porky flavor and is what Crisco was imitating when it was developed. I also used Adams chunky PB because that is all I had. Fabulous. these were a bit time consuming to make but amazing to eat …..oh look they are almost gone! Dark cocoa does taste awesome. Yup, these are as good as you think they’ll be…if not better! I’m a sweet-and-salty addict so I finished mine with a sprinkle of sea salt on top and will definitely do that again next time. I froze half the dough; it’s just begging to be popped into the oven this evening. Thank you, Deb, for yet another winner! Also just wanted to add that I only had regular cocoa so I used that and was not disappointed! Followed the rest of the recipe exactly and used the food processor and these came together easily. I saw this recipe at 9:15 PM and knew I had to make them before I could go to bed. They were fantastic! I used “natural” peanut butter because that is what we had on hand and they still turned out wonderfully. Not a big fan of peanut butter. Do you think these would also be good with Nutella? Too sweet? Not solid enough? Just made these and brought them into work. Evil, evil, evil cookies! I’ll be making them again soon. I might pinch them into triangle shapes to make Chocolate-PB Hamentaschen for Purim. 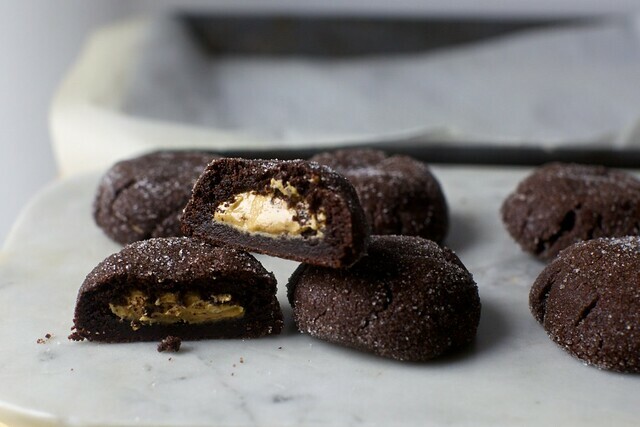 These turned out amazing and decadent and ridiculously rich. I’m glad you include weight measurements in your recipes, as I have a kitchen scale and find that all my baking turns out better when I go strictly by weight versus measurement cups. I only made 2 dozen cookies, but found I had a bit leftover filling (even using heaping teaspoons) and enough dough for 9 more plain cookies. I haven’t made these yet, but I feel I must chime in about using the scale. I bought one about a month ago on the recommendation of Deb and others’ comments on this site. I love using it. I don’t have enough experience yet to say it results in better outcomes, but I just love the ease of using it. Mine is an Ozeri, purchased for about $14 or so. This recipe looks AMAZING! Do you think it’d work okay to stuff and shape the cookies a day or two ahead of time, storing them in the fridge until they’re ready for the oven? Yes, but keep them in the freezer. I made these cookies today, and they were worth all of the effort. I love love love peanut butter, so the combination of peanut butter and chocolate is as close to nirvana as I can get. I will make these again and again and again, did not change one thing in the recipe, did it with my stand mixer and found them to taste as delicious as the picture. Once again, you did not fail!!!!!! Everyone RAVED about these! The “sparkly” sugar exterior drew people in and the taste hooked them. I weighed the flour and didn’t have any issues with crumbly dough mentioned below. Counting the number of centers I made and then splitting the cookie dough into the same number before rolling each one out was helpful. Thanks, Deb! This recipe is the bomb! I think I made my PB balls a little too big, so didn’t make quite as many as expected. People at work raved about it. I did have one question – I doubled the recipe and used weight when making the filling – it seemed like way too much filling compared to the volume measurements so I switched to that. Are you sure the grams are correct? These were delicious! Made them with Teddy’s salted smooth peanut butter, which is a natural pb. They seemed a little dry upon assembly but once baked were wonderful! What wonderful treats! I made them as written, yielding 23 cookies (the dough for each was about 28 g). Taking other commenters’ advice about crumbly cookie dough, I really beat the sugars/butter/pb mix, and got workable results. I did find that chilling the dough for 20 min yielded smoother-topped cookies, but baking then straight after mixing was fine too. They turn out adorably rumpled. Any ideas on other filling options besides peanut butter? Like marshmallow? Should I use marshmallow fluff or can a plain marshmallow work? Also, how would you use jam as a filling? And any ideas on how a mint creme filling would work? These were a hit at our party. I used crunchy peanut butter in filling for more texture. Also, these don’t change shape much from raw to baked so make sure you like the look of them when they go in oven because they stay that way. Made these gluten free (subbed in Bob’s Red Mill Gluten Free 1-to-1 flour), and they turned out perfectly. Gluten-eating family and friends could not tell. So good. I was surprised how quick and easy these were to make. I used Hershey’s special dark cocoa (half Dutch, half natural blend) as if it was fully Dutch processed. Normally I have Dutch on hand, but not now for some reason. I was planning to bring half of the batch to a work meeting on Valentine’s Day, but I can’t stop eating them. At this rate, I’m just hoping some of them survive until my husband gets back in town. They’re dangerously good. Are these best served warm(ish)? Does the PB filling remain soft even once the cookies are completely cooled? These are just…perfect. I’ve made them twice in the last 5 days and regret nothing, other than sharing too many with coworkers. The first time around, I rolled the scooped dough in my hands before flattening it which was not necessary (and maybe explains why it was a bit crumbly?). Thanks for another keeper, Deb! I made these with one change. I melted chocolate chips to replace the peanut butter in the cookie part. They were perfection! I liked them so much more than I thought I would! I made these as a Valentine’s gift for my husband. 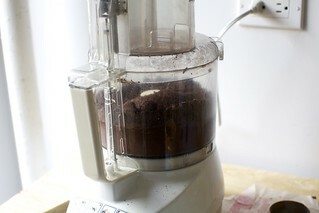 I used regular cocoa with baking soda, cold butter and the food processor. Like several other commenters, I found the cookie dough very, very dry–unworkable. I added about 3 extra tablespoons of peanut butter and that fixed it. They also seemed to bake up fine and DH looooved the flavour. I do not own cookie scoops so guessed at the amount for filling and the cookies. I ended up with 26 balls of filling and enough dough for 20 cookies. Once I became more confident I made the dough thinner, so I probably could have stretched to 22 or 24 cookies. DH doesn’t mind eating a few PB balls on their own, so they were just an extra little treat for him. These cookies are rather large. I will likely make these smaller next time, which would equal more cookies but not as big. I used freshly ground peanuts and it worked just fine. In fact, I think chunky peanut butter might be awesome to add crunch and texture. And I accidentally used almond extract instead of vanilla, and still very tasty. These are a definite winner. I made a double batch (had to do the food processor thing twice because it would not fit). They were a big hit at work, and people mentioned that they loved how the cookies weren’t too sweet. I sprinkled a little turbinado sugar on top for crunch since I ran out of sugar. These are also great the next day! It’s definitely an endeavor to shape the PB balls (I got a head start the day before I made the cookie dough, and kept them in the freezer- they definitely start softening up fast once you take them out) as well as putting together the final product but it’s well worth it. These are excellent. I’ve eaten three, which is far too much already, yet still I’m tempted to have another…. must stash them away in the cupboard…. On a side note, I really like the granulated sugar on the outside. Adds the perfect amount of crunch. Thanks for a great recipe! Made it yesterday with black cocoa and realized while putting the cookies together that I forgot to add salt to the dough so just sprinkled some on top and I think it worked ok because it was an absolute HIT! Thanks Deb! + baked for 9 minutes, but 8 would’ve been enough. It was a comedy of errors making these, the most notable being I spilled hot butter all over myself and kitchen floor when I softened it (for too long, apparently) on a plate in the microwave on top of the fridge…but all turned out okay. Seems like these are actually pretty foolproof- was worried that my PB was a bit oily but everything was still easy to work with. I think I overestimated my 2T for the exterior since I only ended up with 18 cookies, but man are they delish. I measured by weights and used the food processor method and it went perfectly — another great recipe, Deb! I portioned out all the peanut butter filling last night and froze overnight. This morning I pre-rolled all the cookie dough balls and the assembly went really smoothly. Cookie dough was a great consistency and the peanut butter didn’t go soft. I made no modifications to this recipe. They turned out great and very delicious. My team at work loved them, too! Definitely a keeper and will bake these again and again! I had difficulties getting my measurements straight and ended up with a lot of extra Peanut butter centers…. I’d make another batch of the outer cookie but I’m out of peanutbutter to add to the outer cookie. Do you think I could skip the PB there and use 1/4 cup more butter instead to hold the cookie together? Also. These are so insanely good I’m glad it doesn’t make a ton. Seriously delicious. I ended up making the second batch without PB in the chocolate portion simply because I was out. I subbed 1/4 cup of additional butter instead The taste of the chocolate was great- the cookie spread more- ie was less fluffy by still edible and If you find yourself in this situation they’re still incredibly delicious and no complaints would be offered by anyone. I made these for Valentine’s Day and they were absolutely PERFECT!!!! I finally made these! I made the mistake of asking my husband to scoop the filling. When I went to assemble the cookies I saw that he made them almost double the recommended size! Deb said these make 22-24, we made 15. Giant and rich, but absolutely delicious over vanilla ice cream. These tasted amazing but looked terrible – like little UFOs with a mound in the center and flat cookie spreading out all around. Was I suppose to chill the chocolate dough as well? These are fabulous cookies! I made them with freshly ground peanut butter. I would suggest making smaller versions — they are very rich. I also think that you should rename them to Chocolate Peanut Butter Pillows. I cannot find “Dutch” chocolate. However, I did find “Saco”- premium natural & Dutched blend cocoa! Can this be used in place of Dutch Cocoa? Do I use baking soda instead of baking powder in this case? Thank you! I love all your recipes and detailed instructions. Not sure why so many people had issues with this recipe. I weighed all my ingredients and they were perfect! I think using cup measurements screw people up. Go get a scale! Plus, you’ll use less dishes! This recipe is flawless! Love these! My daughter’s on a non-dairy diet at the moment, so I used a mixture of coconut oil and Earth Balance (totaling 115 g) and had great results using the food processor. Followed your suggestion to use 1/2 tsp of baking soda bc I didn’t have dutched cocoa powder and they’re nice and dark. I used the peanut butter I had on hand, which was Smucker’s creamy – it’s one of the ones you have to stir – it’s more grainy than Skippy or Jif, but it worked perfectly. So pleased I’ve made them twice in one week! I love the idea of these cookies! I made them and found the cookie to be a bit dry. I had a suspicion this might be the case since when I flattened the cookie slight on the cookie sheet, in the final step, the cookie dough started to crack even under the lightest pressure. Any suggestions how to make the dough less dry. THANK YOU! these are amazing!!! The first time I made them, I made them with my 3 year old and so we went a little slowly. By the end, the cookie dough part was drying out and a little hard to work with. The second batch I added a little bit more butter to the batter to make it really easy to smooth around the peanut butter filling. I’m sure the first attempt was an amateur/user error but the results were worth all the effort – these cookies are AMAZING and will be made many more times in this house. Not being pedantic, I swear, but your description of the first kind of cookie is off. I’m mentioning it only because it’s an interesting technique and little kids love smoothing the Reese’s cup in. Tiny muffin tins. Check. Spray with Pam and put a ball of the dough in the cup. Bake and take out slightly underdone. It will have expanded to the sides. NOW press in the pb cups, bottom side down. The cookie ball molds around it and there’s no danger of the chocolate overbaking. These stuffed ones look just as delicious. These might be the best cookies I’ve ever made! One note, I made them with natural peanut butter (because it’s what we keep on hand) and I had to add a bit more to both the filling and the cookies to get the consistency right. My daughter (6 1/2 Years) said biting into these cookies was like biting into a soft pillow! I agree – amazing texture and kinda fun to make. Yes! Yes! Yes! These are the peanut butter cookies that I have been looking for, absolutely delicious!! I was a little worried they would be too sweet after rolling them in sugar. But they were perfect! This is the recipe that convinced me I needed one of your cookbooks. As good as you imagine! TY! These were superb, extremely well received. I used Skippy creamy peanut butter in both the cookie batter and the filling. The cookie batter handled like a dream, no crumbling or cracking. I weighed both the cookie balls and the filling balls for consistency. Mine were 20 g and 12 g, respectively, which gave me one extra cookie without filling, which was delicious, too! Going on our short-list of favorites. I jumped on the bandwagon yesterday and I’m so glad I did! So, so good. Made these today, using extra-crunchy peanut butter. I had to add a spoonful extra to the filling to keep it from being too dry (most likely due to the chunks of dry peanut in the peanut butter), but even an extra spoonful wasn’t enough to make the chocolate dough pliable– as others have noticed, it was the consistency of wet sand. I drizzled in about 2 tbs. of milk and buzzed it in the food processor for a few seconds and that did the trick! I was generous with the salt in the filling and the results were amazing! Bless you for listing weights for sticky ingredients! Not having to extract peanut butter from a measuring cup makes this recipe about 85% less finicky to make! I love being able to just plop it into a bowl on a scale and keep going with the recipe. These cookies are so delicious. You need a big glass of milk and somewhere to have a nap. I highly recommend this recipe. Thank for another winner. Made these cookies for Charity Bake Sale and they were huge hit. Holy moly! I made these today & wow they are amazing! I need to give them away before I eat them all. Thank you for the recipe. I will make them again & again. 1st of all, these are so delicious. Second, I had trouble with dry filling too. I made this recipe using the weights so I know the measurements were accurate. I did it in the food processor w/ room temp butter. Next time, I’ll process a little longer and if that doesn’t do the trick, I’ll add an extra egg per Beth’s suggestion above. Third, I used TJ’s natural PB which is a bit thinner, and would have thought that would help with the crumbly dough. It did not, and it also made the PB filling impossible to work with unless frozen. I scooped the dough w/ a #40 scoop, and instead of working it in my hands, pressed it w/ a measuring cup to flatten it out, so I would have them all ready and it would be easier to quickly put the PB in and fold them up into a ball (in my hand). That process worked well. I have made this recipe and the one on the food52 site. I think the difference in the dry dough is that Deb’s recipe uses much more cocoa powder than the other recipe. I would try this one again with 1/2 cup instead. It looks so yummy, thanks for the recipe. It was too sweet what I did to fix this is I added 4 more tablespoons of unsweetened cocoa powder and added less peanutbutter. A really tasty cookie and one that will surely please any chocolate + peanut butter lover. I used the room temp butter + stand mixer method and the dough formed beautifully around the peanut butter centers. However, the next day the cookies were quite crumbly. The flavor was still really good but I was sort of surprised by how sandy they had become. For reference, I used the two teaspoons of baking powder but used a Hershey’s Special Dark cocoa (a blend of natural and Dutched). Could this be the culprit? It was just odd because the cookies were totally fine on Day One. These cookies are the bomb dot com. The beautiful thing is watching an unsuspecting person’s face as they discover the surprise peanut butter filling. From my nephew, whom I sent these at college, I got these four texts, second apart. Perfect exactly as the recipe describes. I never get more than 22 cookies out the recipe and I bake them at the full 10 minutes. Perfection. What am I doing wrong? My filling is a dry, lumpy, grainy mess. It won’t hold together at all. I followed the directions exactly, using Skippy Creamy, but there is no way this filling will work. Any tips? Was it cold? Or maybe too warm and it split? Does it seem split (i.e. part oily, part solid)? What kind of powdered sugar did you use? The first time I made these it was with my stand mixer. They came out perfectly. Tonight I made them in my food processor. The chocolate cookie part is cracked on each cookie. Nothing stayed together. Bummer, I blame the food processor. Very impressive looking and the cookie does indeed have a pillowy texture. I wish the chocolate taste was more pronounced but I did not use Dutch process cocoa powder, so that’s likely on me. The version here is fantastic, but for anyone looking for an easy peanut free option, wrapping the chocolate cookie layer around a Kraft caramel worked pretty well. I’ve been making these cookies for months now using my stand mixer. Today I tried it in my food processor and it didn’t work at all! The dough was crumbly and I had to use a lot more to cover the peanut butter. They cracked when they cooked too. Not sure I’ll use the food processor again. They always came out fine with my mixer! Second time making these. Takes a long time from start to finish, but very, very tasty! Thank you for your inspiration. I am not an experienced baker but I wanted to give this recipe a try. After one test batch and then a final contest batch, I won the judges competition at work for Best Sweet! It was fierce competition amongst the sweet categories and I could not be more thrilled. I used the Valrhona cocoa and the Nielsen Massey vanilla, delish! Hi there! I used the food processor method and measured by volume….my dough was pretty crumbly and they cracked when I flattened them on the baking sheet. Is this the consistency of the dough or did I do something wrong? Thank you!! They can be a little dry and will crack if you press to abruptly but it should be mostly avoidable if you’re gentle in pressing them. Hello, Deb – these look scrumptious! can you freeze the filled cookie balls and bake them later? Thanks! 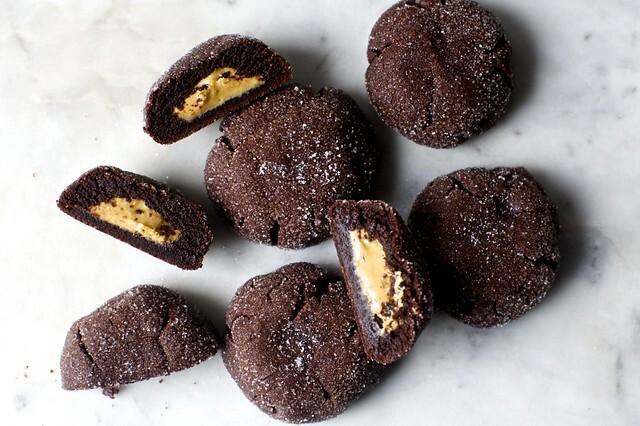 These are the best chocolate peanut butter cookies of. all. time! Hi – I’m never quite clear if the term “powdered sugar” means regular sugar or confectioners sugar. Which do you use for the filling? And, do you use salted peanut butter to start with and then still add salt? Or unsalted PB? Thanks! Confectioners sugar = powdered sugar. I used peanut butter with both sugar and salt in it (Skippy). My daughter & I have been trying (for years) to make the perfect Nutella-filled cookie. I think this format would work well. Wondering what I would substitute for the cocoa (a cocoa-based cookie with Nutella might be overkill). Thanks! 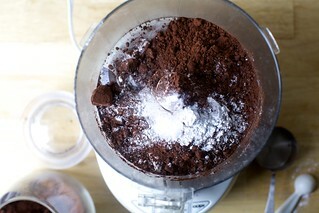 You can try to swap the cocoa with an equal weight of flour, but it might take some tweaking to get it right. I did not see an answer to the question: if freeze these unbaked and bake directly from freezer, what is the baking time? Thank you! I haven’t checked the baking time but would imagine it’s just 3 or so minutes longer, tops? These are so delicious. I needed to make them more holiday festive, so I dipped the tops in chocolate and added some sprinkles. They look awesome, only wish I could post a photo! Has anyone tried it using a spread made from powdered peanut butter? Holy crap these are amazing! I’m so excited for a new favorite cookie. I’m wondering if anyone else had an issue with the bottom of the batter getting dried out and crumbly. I’m not sure if I wasn’t working it fast enough or if it’s because I made them in winter and it’s a bit cold. I worked the dough in my hand to warm it up and make it softer. I’ll definitely make sure all the cocoa powder on the bottom of the bowl is mixed in better next time. And there will definitely be a next time!! I made these today with all the ingredients as specified, and followed the recipe steps. I knew I was in for trouble at the sight of the final cookie mixture. It was so dry, like it needed another egg. I used a hand mixer, don’t have a stand mixer. By the last few cookies, which finished looking nothing like yours by the way, it was like working with sand! What went wrong? They taste great. I’m sharing baked goods with a friend, but I’ve told her not to look at the picture…… I didn’t see any comments like this in the feed, sorry if I missed it. Is it possible that the dough dried out as you were balling them, or was maybe just a little unevenly mixed? Could have. But the only cookie that was easy to flatten and put frozen PB was the first one. I mixed well after each step. I love chocolate and PB! Should I cover the dough while adding PB? Made as directed, used callebaut cp777 cocoa and jiff PB, nothing special. Fine but somewhat disappointing. I made these cookies, and I can’t wait to do it again. I couldn’t find dutched cocoa so I had to do it with the regular stuff the first time. I had no issues with the dough. I made sure everything was super well mixed. Skippy was my peanut butter of choice but I might give almond butter a shot next time. Yum! Thank you! I am tickled by the Mary Berry reference. I made these last night, and they are AWESOME! Also, easier than I thought they would be. Thank you so much for bringing this recipe to my attention. I FINALLY made these and they are to die for. The only change I made was to use half powdered sugar and half light brown sugar (by weight) for the filling to make it more Reese’s cup-like. It was perfect. It’s super dangerous that I know just how good these are now. These were AMAZING while still warm, and still very good for a few hours after I pulled them out of the oven. That night, and the next day especially, they got pretty dry. I know baked goods are best fresh, but these seemed to age faster. Also, a little fussy to make. I don’t mind fuss, but would need a bit more longevity for these to become a staple. My 13 year old daughter just made these for the second time, and darn are they good. The first time we only had a medium egg and the dough was a little crumbly. With one large egg it was perfect…cookies look exactly like Deb’s and taste like heaven–perfect ratio of chocolate to peanut butter. Thank goodness the recipe only makes 24 cookies or we would be in big trouble!! Love this recipe! Used it recently for one of our “try before you buy parties” and the girls at both batches that I had prepared! Hi Deb! Apologies if you have answered this already. Do you think I could sub raw cacao powder for the cocoa powder? If yes, would I treat this as I would the dutch cocoa powder or the standard? Thank you! I have made these many times because they are fantastic. Has anybody has tried to engineer a recipe for these using white chocolate for the outside layer? I would love to try to create a cookie version of the Reese’s white chocolate peanut butter eggs that are out during the run up to Easter. I made the filling and the cookies separately and then used them in my home made ice cream. It’s a pretty awesome ice cream. I prepped the cookies like peanut butter cookies, flattening them a bit with a fork. Bake the cookies for 12-14 minutes. Mine were on the firmer side when done and they hold up well in the ice cream. For the filling, mix it, spread it out on a cookie sheet about an inch thick and put it in the freezer for an hour or so. When you’re ready to add it to the ice cream, use a spoon to break off the size of bits you want. If the cookies don’t crumble easily, give them a bash with a rolling pin and then break them up. I have baking ADHD and rarely want to make the same thing twice! These cookies (and Deb’s brown butter coconut cookies) are two major exceptions to this. These cookies are a bit fussy, but amazing. I’ve made the recipe as written as well as gluten-free (Bob’s Red Mill 1:1) and it’s perfection both ways. I have not had any issues with the dough, but I do find I have to put the peanut butter middles back in the freezer a few times while I’m making them. Maybe I’m not fast enough. Have frozen the balls and baked from frozen with no issues; just added an extra minute to the baking time. Thanks for the awesome recipe! Won my office bake-off with this recipe today – thank you!!! amazingggggg! I used chunky peanut butter in the filling and the choc dough. I used all natural peanut butter (only ingredient peanuts) and I also used coconut sugar in the dough and rolled some in sugar and left some plain and used a 1 for 1 gf flour and they were soooo good! I’ll be making these regularly! First of all, this recipe is fantastic. Second of all, I’ve done some experimenting with the filling and found that subbing Nutella is amazing, and also cream cheese works to make a cheesecake stuffed cookie. I put a small bit of strawberry jam on top of the cream cheese filling before I rolled and covered it. Highly recommend!